For the next three weeks, Pursuing Veritas will be running a series examining Romans, Predestination, and Freewill through the lens of Martin Luther and Erasmus of Rotterdam’s famous Reformation era debate and contemporary Biblical scholarship. Since the beginnings of the Jesus movement countless people, in response to the Good News of God, have asked the same question as the Philippian jailer in Acts 16, namely, “What must I do to be saved?” The Christian tradition claims to have knowledge of the true way for humanity to possess eternal salvation through the sacrificial life, death, and resurrection of Jesus Christ of Nazareth. As Christian theology developed its earliest centuries, a number of theologians began to construct understandings of how God and humanity interacted within the process of salvation based on Christian scripture and the community of faith. Christianity has grown, spread across that world, and become incredibly diverse in the nearly two thousand years since the life of Christ, and theological understandings concerning the salvation of humanity have by no means remained uniform within the Christian tradition. Considerations of Christian reflections on Roman, Predestination, and Freewill far surpass the time or energy that can be exerted on a blog series. In an attempt to do some justice to this complex issue, however, I will engage three primary historical conversations: that between Augustine and Pelagius in the early Church; the Reformation Era debate between Martin Luther and Erasmus of Rotterdam; and modern scholarship. For each of these periods, while general conceptions of predestination and freewill are considered, special attention is given to the role that Romans 7-9 has played (and continues to play) in Christian thinking about the roles of God and humanity in eternal salvation. We begin with a “contextualization” of discussions of predestination and freewill within the Christian tradition by examining the earliest (and arguably most widely influential) conversation on this issue, that between Augustine and Pelagius. The largest portion of this series considers Luther and Erasmus’ understandings of human salvation. 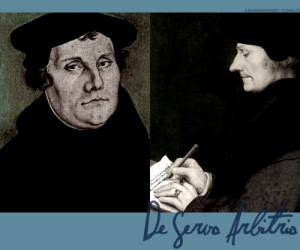 In their use of Biblical materials, especially Romans 7-9, in their constructions of the human will, Luther and Erasmus interacted with a portion of Paul’s letter that has come become increasingly studied under the auspices of modern Biblical scholarship. After considering Luther and Erasmus’ use of material in Romans seven through nine pertaining to salvation, we undertake an examination of some recent scholarship on Romans in an attempt to critically examine Luther and Erasmus’ use of Pauline material within their respective theologies of salvation. Through this study, we will see that while modern scholars by no means present a unified perspective on Romans 7-9, they do offer several strong critiques of both Lutheran and Erasmian use of the material.